What Are the Common Ingredients Found in Greens Products? What Are the Uses & Benefits of Greens? Who Can Benefit from Greens? Are There Any Side-Effects of Greens? How Do I Take Greens Supplements? How Do I Pick a Good Greens Product? Greens supplements are nutrient-dense products can help you get your diet back on track in an easy, convenient way, while allowing you to go about your life as usual. In order to help you find a good product we’ve researched & compared the best greens supplements on the market right now. This product is a super effective formula that uses certified organic ingredients that are produced in “farms, not factories.” It is an amazing product from a reputable company. The value of this product is far more than its dollar cost. Green Food Blend, consisting of organic wheat grass, organic barley grass, organic alfalfa, organic spinach and more. Antioxidant Blend, consisting of organic rose hips, carrot, cherry, green tea, acai, and more. Who makes it: Amazing Grass is a company dedicated to “helping people lead healthier, more active lives through organic, plant-based nutrition.” Brandon, one of the founders, loved greens and convinced the other founder Todd to switch from coffee in the morning to his greens drink. That started it all, and in 2002 they founded Amazing Grass. 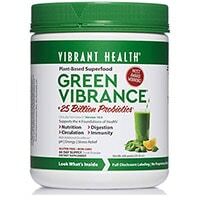 Vibrant Health Green Vibrance is a powerful digestive support supplement that will provide your body with potent micronutrients and aid your ability to absorb them. This formula contains 25 billion active CFU’s of probiotics, which is well over the threshold of 3-4 CFU’s for a quality digestive support. Cereal Grasses blend, consisting of barley grass, oat grass, wheatgrass, and more. Plant based micro-Nutrition blend, consisting of chlorella, spirulina, beet root, zucchini, spinach, and more. Antioxidant Life Preservers blend, consisting of tomato, strawberry, acerola, amla, apricot, goji berry, gingko biloba, green tea and more. Immune Support blend, consisting of astragalus root, arabinogalactans extract and more. Adaptogens, including eleutherococcus senticosus root extract, holy basil extract, and suma root powder. Skeletal Support blend, consisting of cissus quadrangularis, lichen oil and boron. Fiber blend, consisting of fructo-oligosaccharides, flax seed powder, and more. Liver Support blend, consisting of carrot root, chicory root, dandelion root and more. Enzymes and Tonics, including ginger root and enzymes. Probiotics blend, consisting of lactobacillus, bifidobacterium, and more. Who makes it: Vibrant Health’s mission is optimum health for all of its customers. They value transparency in their products, so they do not ever put misleading proprietary blends as ingredients in their supplements. They also acknowledge that dietary nutrition is a dynamic field, so they create current products that are up to date with the most recent scientific discoveries in the field. This is a superior greens supplement with extremely competitive pricing for the value. It is rich in chlorophyll with twice as much dark greens than most greens formulas currently on the market. 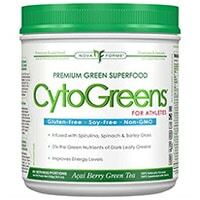 One of the only supplements that includes its ORAC rating, or Oxygen Radical Absorbance Capacity, Cytogreens features 346 mg of high ORAC free-radical fighting antioxidants. Green Performance Matrix, consisting of spirulina, barley grass, spinach leaf, chlorella, matcha green tea, and more. Proprietary Blend, consisting of power mushroom complex, eleuthero root, ginseng root, tangerine peel extract, and more. Free-Radical Defense Blend, consisting of brazilian acai berry, amla berry, acerola cherry, citrus bioflavonoids, and more. Digestive Enzymes, consisting of protease, peptidase, cellulase, and more. Who makes it: Novaforme is an athletic supplement producer that puts a lot of time and effort into creating synergistic formulas with quality ingredients. They design their products for athletes who love clean eating and want to maximize their health. Perfect Food is a powerful greens supplement made from entirely raw and organic sources and is produced by one of the most environmentally responsible companies with traceable sourcing and raw. It is a green juice powder with 34 nutrient dense, raw, organically grown sprouts, seeds, and vegetables. This product provides a convenient veggie juice that can be added to your daily diet. Organic Farmed Juice Blend, consisting of barley grass juice, alfalfa grass juice, oat grass juice, wheat grass juice and more. Organic Fruit and Veggie Antioxidant Blend, consisting of (all organic) apple, beet, broccoli, carrot, spinach, pineapple, blackberry, bell pepper, garlic, ginger, kale, asparagus, and more. Organic Sprout blend, consisting of flax meal, amaranth sprout, quinoa sprout, buckwheat sprout, chia seed sprout, and more. Raw Probiotic and Enzyme blend, consisting of lipase, protease, bromelain, lactase, and more. Who makes it: Garden of Life is a brand that is all about quality fresh organic ingredients. They ensure that their product is raw from the soil that’s used to grow their ingredients, to the finished product. Garden of Life is a certified vegan, certified organic, informed choice, non-GMO, Star-K Kosher, U Kosher, B Corp, NSF Gluten free, LEED gold, and Green-e energy. Being one of the most environmentally responsible supplement companies, they are genuinely concerned with providing quality and natural ingredients. Their website provides information about the farms that grow their produce, and make their produce traceable all the way to the roots in the soil. 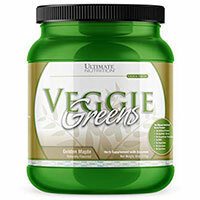 Ultimate Nutrition Vegetable Greens is a powdered greens formula that is a combination of over 62 phytonutrients. It contains probiotics and prebiotics, and does not use artificial flavors or sweeteners. It rates a highly on customer product reviews. 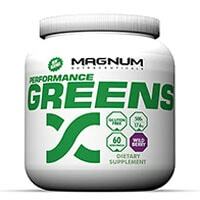 This formula is a quality, nutrient dense greens supplement. Essential Fatty Acids blend, consisting of lecithin, flaxseed oil, borage oil, and more. Green Food Concentrates blend, consisting of barley greens, alfalfa, wheatgrass, buckwheat, spinach and more. Sea Vegetables blend, consisting of spirulina, chlorella, dulse seaweed, kelp and green algae. Land Vegetables blend, consisting of brown rice, beet root, carrot, fermented soy, celery and olive leaf. Phytonutrients blend, consisting of acerola berries, blueberry fruit, quercetin, green tea extract, resveratrol, and more. Cruciferous Vegetables blend, consisting of broccoli extract, cauliflower, brussel sprouts, kale and watercress. Standardized Herbal Extracts blend, consisting of cranberry extract, astragalus extract, milk thistle, ginseng, ginkgo biloba and more. Fiber blend, consisting of apple pectin, oat bran and inulin. This product probably has the most value out of all the products on our list. It has way more probiotics than the 3-4 billion CFU threshold, no synthetic ingredients, and tons of vitamins, minerals, antioxidants and phytonutrients. Lowest calorie of the top tens, at only 15 calories per serving! The most resveratrol of any others on the list! 16 billion active CFU’s of probiotics! Greens blend, consisting of barley grass, wheat grass, wheat sprout, dulse, chlorella, spirulina, oats, apple fiber, and much more. Antioxidant complex, consisting of raspberry, pomegranate, cranberry, acai, green tea, and more. Enzyme blend, consisting of Bromelain, Papain, Protease, Amylase and more. Probiotic (dairy free) Blend, consisting of lactobacillus acidophilus, bifidobacterium longum, lactobacillus casei and lactobacillus rhamnosus. Who makes it: Founded in 2005, controlled labs was created with the goal of producing the “highest quality products at a price that customers could actually afford.” The company backs any health claims it makes with reputable research, and produces all of its products in a GMP certified for Sport Facility. They make sure that no banned substances are in any of the products or facilities, and they ensure that all of their products are top quality. 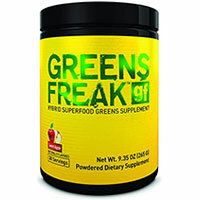 This is an excellent greens powder with a high user rating. This product is of pharmaceutical quality and can give you potent superfood vitamins, minerals, and phytonutrients. Greens Matrix, consisting of spirulina, barley grass, alfalfa, beet root, chlorella, wheat grass, spinach, and much more. Essential Fatty Acid Blend, consisting of lecithin, flaxseed oil, borage oil, coconut oil, and more. Phytonutrient Complex, consisting of goji berry, pomegranate, blueberry, licorice root, green tea extract, cranberry, and much more. Fiber blend, consisting of apple fiber, oat bran powder, and more. Herbal Remedies blend, consisting of royal jelly, cranberry, astragalus, panax ginseng, ginkgo biloba, cinnamon bark, and more. Who makes it: Magnum Nutraceuticals is “dedicated to integrity in producing the highest quality sports nutrition supplements.” Their manufacturing facilities are reliable and controlled due to government auditing which guarantees that the ingredients they use are of pharmaceutical quality! This is one of the most complete greens supplement powders on this list. It combines nine high potency superfoods with 38 nutrient-dense ingredients to create a well rounded healthy supplement. 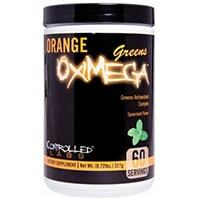 It has great user reviews and has been reported to be one of the tastier greens product options. Is is also made by a reputable supplement company in the world of bodybuilding and athleticism. 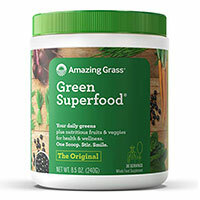 Greens blend, consisting of spirulina, chlorella, alfalfa, barley, wheat, apple pectin, apple fiber, sprouted super grains, superfoods complex, antioxidant complex, and more. Immune Support Complex, consisting of echinacea angustifolia, astragalus and royal jelly. Adaptogen & Adrenal Support Complex, consisting of licorice, suma and eleuthero. Proprietary Probiotic Culture Complex, consisting of lactobacillus acidophilus, bifido bifidum, and more. Proprietary Digestive Enzyme Complex, consisting of bromelain, papain, lipase and more. Liver Support Complex, consisting of milk thistle extract and bilberry extract. Who makes it: PharmaFreak makes some of the strongest athletic supplements out there, and is known for its Ripped Freak fat burner that made the company reputable. It was founded in 2008 by Alex Savva and Don Gauvreau, who both have 10+ years experience in the supplements industry. Gauvreau contributes to the research and formulation of the product, and Savva is a bodybuilder who knows what people in the athletic world are looking for. Together, they created PharmaFreak because there was a need for stronger products that they aimed to fill. Who makes it: Known for its all natural products, NOW foods has been around since 1968 when it was founded by Elwood Richard. Their mission is to “to provide value in products and services that empower people to lead healthier lives.” It is based out of Bloomingdale, Illinois and produces and distributes natural foods and supplements. This is another another awesome powdered superfood supplement. 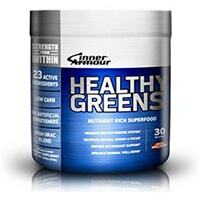 Inner Armour Healthy Greens is well rated in online reviews, and offers a lot of bang for your buck. This product packs in a lot of the best ingredients in concentrated amounts which allow you to extract the benefits of the ingredients; such as spirulina and lecithin. Lots of fiber, 545 grams! Greens blend, consisting of spirulina, soybean lecithin, apple fiber, barley grass, wheat grass, chlorella, green tea leaf, spinach, and much more. Much more, including probiotics, herbs, fiber and more. Inner Armour makes credible and reliable supplements for athletes of all skill levels. Every product has been tested by athletes. Inner Armour products have the Informed Choice logo and are Banned Substance Free. The programs certify that all nutritional supplements have been tested for banned substances. Inner Armour has been in business for 16 years and is based out of Connecticut. 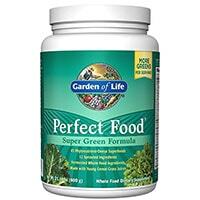 Greens supplements pack a concentration of superfood nutrients into a powder or pill form. They provide your body with an additional boost of antioxidants, vitamins, minerals and more. They also provide you with plant-based proteins and amino acids; the building blocks of protein. They are usually made of ingredients such barley, wheat, herbs, probiotics, spirulina, algae, and fruits and vegetables. These products can be used to reduce dietary and muscular acidity. This is useful to someone who is exercising a lot, because when muscles are being contracted frequently they produce acid; in other words, they make you really sore. Greens can also be used to supplement a diet that is low in fruits and vegetables. When traveling, people often do not have access to as many fresh fruits and vegetables. Greens products are an effective way to ensure that you are consuming the necessary vitamins and minerals from fruits and veggies that your body craves. The average person does not consume the necessary amounts of micronutrients that raw fruits and vegetables provide. To have a balanced diet, a person should consume more than 5 servings of raw fruits and vegetables every day. In reality, less than 6% of adult men and 9% of adult women are consuming more than 5 servings of fruits and vegetables a day. Typically, you should not does not consider taking a greens supplement if you are already consuming 10 servings of fruits and vegetables per day. These products are not a replacement for raw fruits and vegetables, they are a supplementary aid. Greens supplements are derived from entirely natural sources. The nutrients they provide come from dehydrated fruits and vegetables, alfalfa, algae, spirulina, barley, etc. Spirulina – a blue-green algae that is loaded with protein. It is a significant source of iodine, vitamin K, potassium, thiamin, riboflavin, niacin, manganese, iron and copper. It also contains powerful antioxidants. Alfalfa – plant that is a rich source of vitamins, including vitamin A, vitamin C, vitamin B1, vitamin B6, vitamin E, and vitamin K. It also contains minerals such as calcium, zinc, potassium, carotene, and iron. Wheat grass – grass which contains all minerals known to man. It also is a source of vitamin B-complex, vitamin K, vitamin C, vitamin A, and vitamin l. It is a significant source of protein and has 17 different amino acids. It is extremely rich in chlorophyll. Barley – a grain that is extremely high in insoluble fiber which is beneficial to intestinal function. It contains minerals such as manganese, selenium, copper, vitamin B1, chromium, phosphorus, manganese, and niacin. Kale – a leafy green that is a rich source of iron. It is full of strong antioxidants that can help protect against various free radicals, such as flavonoids and carotenoids. It is a source of vitamin A and vitamin C, and it is a rich source of calcium. 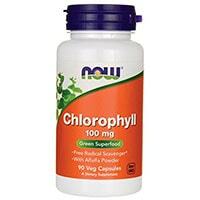 Chlorella – a freshwater algae that is really good at detoxifying the body. It contains vitamin C, vitamin E, all of the vitamin B’s, amino acids and beta-carotene. It also contains minerals such as magnesium and iron. It is higher in protein density than meat. Chlorophyll – a green pigment produced by plants. It has antimicrobial and anti-aging properties. Greens can provide the same powerful boost of nutrients as found in superfoods. Superfoods are rich in compounds like antioxidants, fatty acids, and fiber. Some examples of super foods are kale, spinach, and broccoli. Therefore, greens supplements can provide the same health benefits as a healthy dose of fruits and vegetables. Greens supplements usually include ingredients such as algae, prebiotics, and probiotics as well. The algae they contain are extremely nutrient dense, and safe to consume in their dehydrated form. Greens also have an alkalizing effect on the body, meaning that they reduce acidity levels. When your body’s pH is out of balance, symptoms include headaches, fatigue, stiff joints, inflammation, gum disease, joint pain, muscle pain, and more. The alkalizing effect of greens supplements can help these symptoms, and speed up the recovery process after a workout by alleviating muscle soreness. They also function as a natural antacid that can reduce heartburn and acid reflux. You – Did you know that 87% of Americans do not eat enough fruits, and 91% are not eating a sufficient amount of vegetables? Odds are, you are one of the people who are not consuming the amount of fruits and vegetables the body needs. Overall, just about anyone who wants to be happy and healthy can benefit from greens supplements. People who have an imbalance in pH – The alkalizing effect of greens supplements works quickly to reduce acidity in the body. This helps to improve the overall function of the body and alleviate the symptoms, such as fatigue and headache, that an imbalanced pH causes. Those who suffer from health problems that affect the body’s ability to absorb nutrients – This includes those who suffer from things like chronic diarrhea, food intolerance, allergies, and liver or gallbladder disease. Because greens supplements are in a highly concentrated form, the nutrients they provide are more easily absorbed by the body. More than a pound of greens can be used to make an ounce of powder. Travelers – Travelers who do not have access to fresh fruits and vegetables can supplement their diets with greens. They are portable and nonperishable, so taking greens supplements on a trip is an easy way to ensure that you do not sacrifice a balanced diet. People taking protein supplements – If you are currently taking protein supplements, greens can also be a beneficial addition to your supplement regimen. Protein powders can increase acidity within the body, which we have already established is the root of a myriad of health issues. People who are taking protein supplements can benefit from greens supplements, which can counteract the acidity produced within the body by protein powders. Fitness enthusiasts and athletes – Sore muscles are literally a pain. Taking greens supplements three hours after a workout helps speed up the recovery process and help reduce muscle soreness. The boost of micronutrients helps refuel and revitalize your muscles. In order to redeem the rejuvenating effect, take greens supplements at least three hours after a workout. Some studies have shown that greens supplements can slow the release of insulin to your muscles if taken right after a workout; which depresses cell recovery. Experts recommend that you wait three hours after exercise before taking a greens supplement to avoid insulin depression. Greens supplements do not typically have negative side effects when used appropriately. Remember that greens do have a concentrated amount of vitamins, minerals, and antioxidants; so try not to take more than the recommended daily serving. Iron and calcium can cause toxicity problems when consumed in excess, so be aware of the iron and calcium content of your supplement. Recommended iron intake is between 15-18 mg daily, and recommended calcium intake is 1000 mg per day. Some supplements may contain synthetic ingredients. Synthetic supplements can contain man-made chemical compounds that do not occur in nature; meaning that our bodies were never meant to consume them. Synthetic fat-soluble vitamins can build up in the fatty tissues of the body and become toxic. Did you know that the synthetic form of vitamin E can disrupt the endocrine system, and potentially increase your chances of getting cancer? You can identify synthetic vitamin E on a label if it as “dl” in the name, such as dl-alpha-tocopherol. Taking too much of any supplement can be harmful. Make sure to follow the supplements guidelines as to how much can be consumed per day. Always talk to a doctor if you think you need a larger dose of a supplement per day to make sure that it is safe. Some greens supplements come in a capsule that is swallowed whole like a multivitamin or pill. But, most commonly, greens supplements are found in a powder form. Though they may come in a pill form, remember that they are not a good replacement for a multivitamin. Most greens supplements will have a suggested serving amount that you mix with water. When the green powder is dissolved, it becomes like juice. Greens food supplements can be low to zero calories; so drinking your greens is an easy way to add nutrients to your day without adding calories. The first step when choosing the right greens supplement is finding the best option for your needs. Greens supplements will use a variety of different greens, and will generally contain some probiotics and enzymes. Some supplements contain prebiotics as well, which are bacteria that nourish the good bacteria in the intestinal system; acting as fertilizer. In general, it’s best to avoid supplements that say that they have a “proprietary blend” of ingredients, because this allows companies to list high quality ingredients without actually including a substantial amount. Some greens supplements also contain protein, so if you are looking for a more complete supplement, you could look for products with added protein. Lecithin – improves cognitive performance and memory, extra great addition! When looking at the greens section, look for variety. Price per serving – After assessing the nutrient density of said product and checking for probiotics and enzymes, you can judge the value of the product by the price per serving. The higher-end products can be upwards of $4 per serving, but there are other supplements that are inexpensive but still have valuable nutrients. Make sure to shop around and read user reviews.